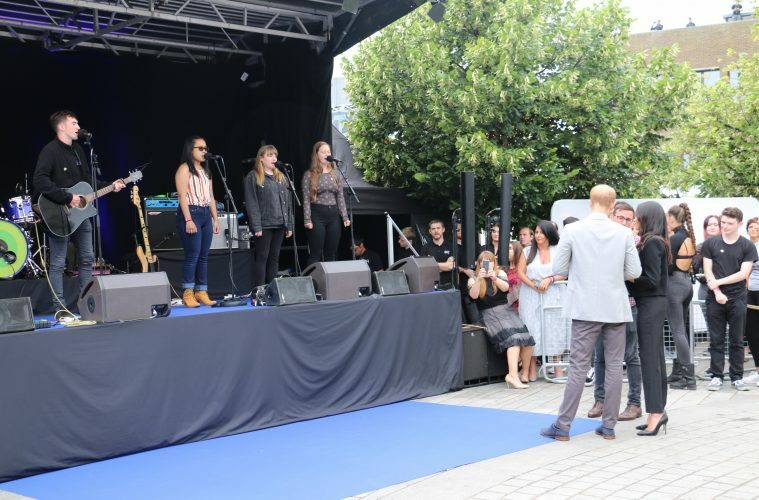 12 July 2018 – 11 talented young music graduates, from The Liber8 Music Project, performed at the CHQ Building in Customs House Quay for the Duke and Duchess of Sussex who were in Dublin this week on their first official foreign trip as a married couple. The students, aged between 14 and 17, participated in the ground-breaking 10-week after school music programme, which is the result of a collaboration between The Digital Hub and the BIMM Institute Dublin. The young people, all living within and around the historic Liberties area of Dublin 8, performed three well-known hits, Rolling in the deep by Adele, Thinking out loud by Ed Sheeran and Read my mind by the Killers, as well as an original song based on Stand by me for the newlyweds. They followed the performances of 2 bands from BIMM: Moon Looks On and Leila Jane. The Liber8 Music Project was included in the itinerary of the Royal Couple as this newly established programme, is a unique vehicle for young people living in Dublin city to be introduced to and to develop their creativity and musical talents, while developing life skills and experiencing a third level college environment. Over the course of 10 weeks, participants complete three modules: Music Styles, Introduction to Performance Techniques and Introduction to Recording and Design. The programme also gives young people the opportunity to engage with some of Dublin’s most well-known musicians as tutors, including Kieran McGuinness, lead singer and guitarist from Delorentos and Louise McNamara, vocalist and guitarist in the twin sister duo group Heathers. The students enter the course often without any musical experience or access to musical instruments, and by the end of the ten weeks, they perform a concert in front of family, friends, and members of the community! Further information on the programme can be found by visiting the Digital Hub’s website at www.thedigitalhub.com/liber8musicproject or by emailing [email protected]. Previous ArticleAre women returners the solution to the tech sector skills shortage?